Will Goad joined the company as a director in 1998. 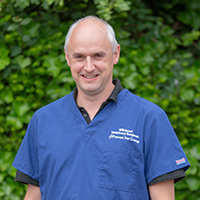 He is usually based in St Andrews, with interests in small animal surgery and dentistry and also acupuncture. Most of his leisure time is spent with his family, including his three sons, and young Beagle. Will is also a keen runner and cyclist, and enjoys long adventure-type events across the country.